Report by Mike Lancaster. Photo by Robert Seymour. At the DDAS Observing Session on Saturday 17th November 2012 we were treated to remarkably clear and transparent skies with very good seeing. Jupiter looked spectacular through the 10" Newtonian under the dome. We also viewed a medley of deep sky treasures including The Great Andromeda Galaxy (M31), The Double Cluster in Perseus, the double star Albireo, The Ring Nebula (M57), the Pegasus Globular Cluster (M15) and the Great Orion Nebula (M42). M42 in particular was absolutely stunning in the 10". November is a great time of year to do observing as one still has access to the summer Milky Way in the earlier part of the evening, the autumn constellations of Pegasus and Andromeda are well placed, and later on the winter constellations such as Taurus and Orion are visible. Especially memorable this evening was the sight of Jupiter shining brightly in Taurus with Aldebaran not far away and the bright stars of Orion close by. We even managed to see a few meteors although their paths suggested they were sporadic ones rather than part of the Leonid shower which had peaked the previous night. 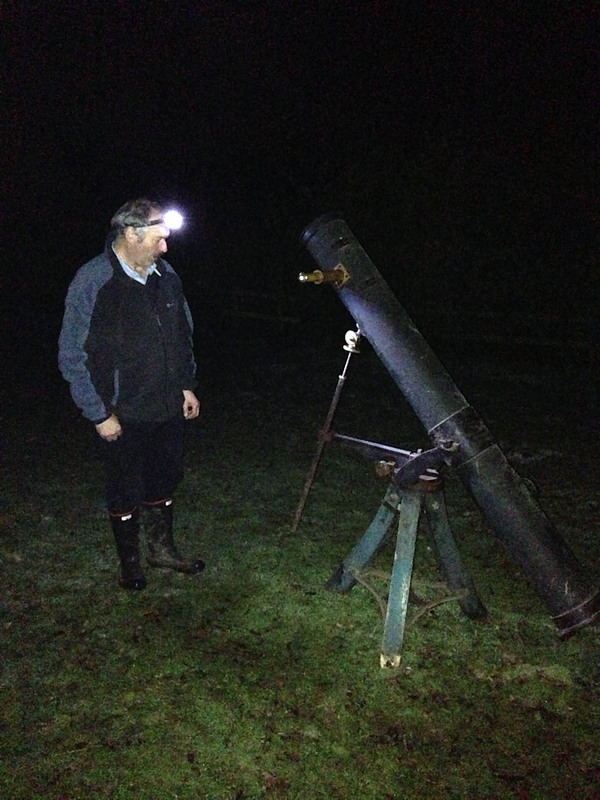 An added bonus this evening was the antique telescope that DDAS member Mike Dumelow had brought along. This dated from the 19th century and was a long focal length 6" Newtonian reflector with a tube made of cast iron. The telescope was placed on the original alt-azimuth mount which had slow motion controls which were very easy to use. The mount sat on a curved wooden tripod which is typical for 19th century equipment. The eyepieces were brass and of the Royal Astronomical Society (RAS) thread. The telescope gave a very crisp view of Jupiter.